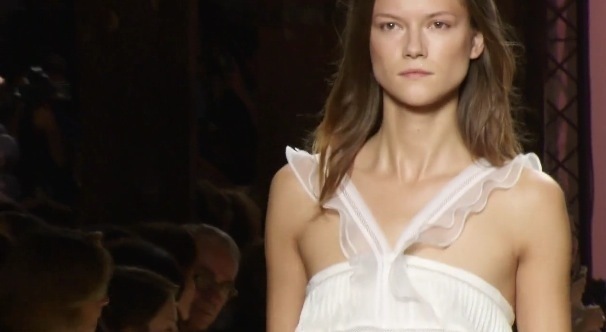 Here are some close-up images that I’ve taken from the Spring Summer Isabel Marant Runway Video. The collection is soft and feminine and girly mixed with a Camo-Denim edge. The pieces look like they can be endlessly mixed and matched with things already in your closet. I love the die cut fabrics, all the ruffles & understated colour tones and as always the distinct Rock Chic black numbers. I think we will be seeing and wearing one or more of these themes next Spring-Summer by many High Street labels.